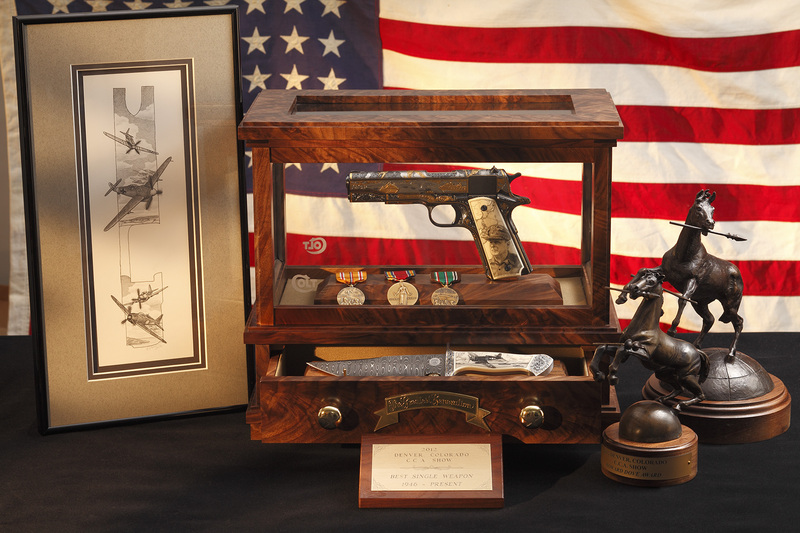 At the 2012 Colt Collectors Association show, last month, the "Greatest Generation" Colt 1911 won the Howard Dove award, and also Best Single Weapon, 1946-Present. The latter is not an award that is given every year, but rather is given as the judges see fit. It has been getting some huge attention and is going to get some huge publicity. The professional photos have not yet been publicly released, though I have been given permission to share one (and only one!) of them here. It wasn't easy to pick one, of course I want you to see everything, but this has everything. The gun, the knife, the gorgeous case, the awards, and the art that I created for the top slide. I am so proud and honored to be a part of this! The project will be shown at the Firearms Engravers Guild of America show in Reno in January of 2013. I may have permission to leak another photo or two before then, but I think it's pretty much staying under wraps until the big public release! Wow, Katherine! That is awesome! You must be excited and overwhelmed - very wonderful! I'm very impressed!!! Has Ted seen this? Ted has seen the closeups that I posted when I was working on the grips but he has not seen this particular photo.